Xavier will steal your heart! You know when you read a book & it gives you such intense feelings that gives you chills because you can relate to the main character so well? This is that book! I'm a total BADD groupie for these brothers. Every book Author Jasinda & Jack Wilder have given us in this series has captured my heart. All can be read as standalone but believe me, once you start any one of the brothers books, you will want to get to know all of them! Xavier... He is totally the best for last in this series. He is the youngest of the brothers at the ripe age of 20 but his intellectual mind and his raw and honest heart will have you claiming him as your favorite. When Xavier meets Low, his world of knowledge is thrown into a loop of highly emotionally charged feelings and romantic words that will make any woman swoon 100x hard when meeting him. Loved the build up and anticipation of finding out if Xavier can conquer his fears that he has held within himself since a young age. The final book in the Badd Brothers series was a little more emotional than I had anticipated. And I love when a book does that to me. This was definitely a great way to end the series. Full of feels definitely has become my favorite of the Badd Brothers. I also love that through out each of these books we always get to see the rest of the family and what they are up to. If you are a fan of the Badd Brothers then this is definitely one to dive into. I knew reading Badd Boy would be bittersweet. Bitter because it´s the last book and conclusion in the Badd Brothers Series and sweet because I couldn´t wait for Xander to get his story. 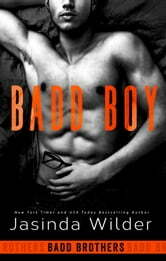 Badd Boy is Xander Badd and Harlow Grace´s story. Xander is the youngest of the 8 brothers. Sebastian, Zane,Brock, Baxter, Canaan, Corin and lucian all found their HEA,Only Xander is single, and he´s the odd one out. His IQ is very, very high, I teaches himself ancient languages for fun only and his brain never shuts down. And then he meets her, Harlow - Low - Grace. She´s Hollywood´s newest face, celebrity and star in the industry. She´s hiding out in Ketchikan and develops a great friendship with Xander. But when the paparazzi find her everything changes. Badd Boy is a great read. I loved meeting all the characters from previous books. I loved how Xander bloomed in Low´s light and vice versa. I connected very easily with the characters and I can´t say how much I love their story. Absolutely terrific! Fantastic story line, believable characters and wonderfully written, just what we have come to expect from Jasinda and never disappointed. Highly recommend this as a 'Must Read' . I absolutely adore this series - Easily one of the top 5 series I've ever read. The Badd Brothers are truly everything you could ever dream up in a book boyfriend and their stories are all amazing. But without a doubt the author has outdone herself with Xavier, the youngest of the brothers, story. It’s so touching and endearing that you can’t help but fall face first for Xavier and his “uniqueness”. Xavier Badd is a genius who has trouble handling most “normal” social behavior situations. He spend his time with his books, building/selling his robots and of course cooking at Badd’s Bar and Grill and totally avoids personal relationships of any kind outside of his brothers and their women. That is until he meets Low, the most beautiful woman he’s ever laid eyes on. But past experience and his “uniqueness” having him running scared when Low starts to show an interest in him. Low, better known as Grace Harlow the Hollywood actress, has escaped the camera and paparazzi and had docked her yacht in Ketchikan, Alaska. That is where she meets Xavier Badd. He fascinates and challenges her. But most of all he likes her for herself since he honestly has no clue who she really is. But can she break through his barriers she doesn’t understand? Xavier and Low’s story is tender and heartwarming yet heartbreaking at the same time. The socialite and socially inept are worlds apart yet fiercely drawn to each other. The story will have you smiling and wiping at tears as you follow their journey. But trust me it’s an amazingly written journey that you absolutely do not want to miss. I highly recommend reading the entire Badd series, as just like Badd Boy, you will not be disappointed and the storylines just keep getting better and better as the series rocks on. 2 Resounding Thumbs Up for the series and book #8 - very well done!